← So are the Barbarians Coming or No? As our pastor has also recently confirmed, there isn’t really anything difficult to understand in James’ words. McKnight sees it as plain as the directions on a stop sign. As the author suggests, think on what we’ve done with this simple verse of instruction. 1. We didn’t like the word “religious.” It’s now a bad word among believers. We gave the word to the Pharisees to get ourselves off the hook. 3. Pure and faultless? Can’t we just measure the quality of our religion by church attendance, and some other easy to master stuff? Mr. McKnight, heading us into a discussion about rethinking how we read our Bibles suggests, “Every one of us adopts the Bible and (at the same time) adapts the Bible to our culture. Everyone picks and chooses.” Thoughts? 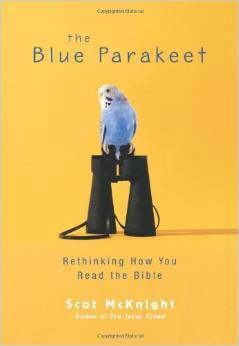 This entry was posted in Blue Parakeet and tagged Christianity, inspiration, interpreting the Bible, reading the Bible, Religion and Spirituality, Scot McKnight. Bookmark the permalink. The longer one walks with the Lord, the more in touch we are with the imbalance of our faith. We know so much more than we live out! Control your mouth, take care of the helpless needy among you and keep yourself form being polluted by the world. That is not hard to understand. It is getting harder and harder to do the last one, isn’t it? Hi Mike, it is very True that if we have God’s Truth in our hearts, our thoughts will follow and than our actions. I wrote a Poem about seeing the Bible as an Awesome Picture, I hope you don’t mind me sharing it (see below ) as you said Mike some see it as a jigsaw, just bits and pieces and no frame. The Scriptures Paint a Picture that is so Awesome in its Dimensions. Holy Spirit Filled Eyes Can See. Breathed on with Love from Our Heavenly Father above. Hi Anne! That is a beautiful work you have authored good friend, and please, always share as the Lord has given to you. Thank you. Thank you Mike for your kind words and encouragement, the poem seemed to fit with what you were saying, most of my Poems are a bit too long for a comment , don’t laugh Mike! not all my comments are Loooooooooooooooooooog anyway I did find a few other poems that were not too long so if they fit I will share them with you. I did post one last week, I received the original poem about 5 years ago by e-mail, it was about the U in Jesus. I was about to Post it when I saw US in Jesus and that reminded me that we are all in Jesus, we are His Body, so as I felt lead to write a new poem with the US in Jesus not just U. Thanks again Mike – Blessings Anne. I will check these out Anne. Thanks for sharing of them. Yes, your poetry is very fitting with the post, an excellent accompaniment. Thanks! Very well said. Seems maybe you’ve read behind Mr. McKnight some also? 🙂 I love his “put the Bible back together” and read it as it was meant to be read… as a complete story. Blessings today!